Continual innovation is at the base of the Lightflow Rendering Interface. A completely modular and procedural approach has been adopted from the ground up to allow constant growth with time. The key idea is to produce a live software project able to modify itself according to new hardware technologies, without ever loosing its solid consistency and always mantaining the best speed to quality ratio. This strategy has already shown its benefits by producing an incredible list of features in a few years' development. A powerful proxy solution has been added to allow automatic dispatch of rendering on mulitple machines. Multiple processors can be used to compute both single images and animations at a faster speed. Beautyful light patterns are formed by specular reflectors and refractors such as chromed surfaces, water and glasses. The Multiway Ligth Channels provide a flexible mechanism to perform light redirection even using imaginary reflection paths. Fast radiosity is finally available even on slower desktop computers. Amazing color bleeding makes images alive. The innovative Run-time Adaptive Splitting technology allows perfect geometry curvature with sub-pixel details. The user will no longer need to spend precious time on tedious tessellation parameters. 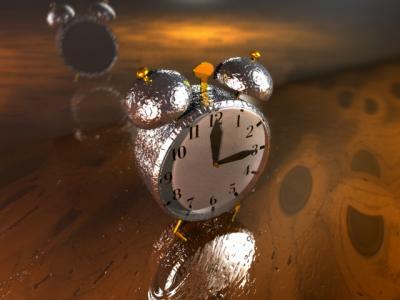 Automatic displacement mapping is performed on all the geometric types, from simple spheres to complex NURBS. This feature, combined with perfect procedural patterns, can provide incredible surface details that would be impossible to model by hand. 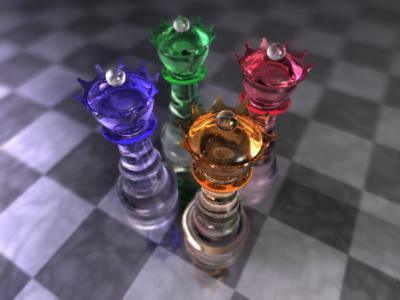 Blurred reflections and refractions enhance the rendering quality by a great factor, overcoming the classical unnaturally sharp appearence of ray-traced images. Realistic clouds, colloids and light beams can now be modeled in three dimensions without using any trick. Solid surfaces can be automatically extracted from three dimensional mathematical patterns and volumetric data. This feauture will allow realistic display of medical images and complex fluid simulations. Standard implementation of trimmed NURBS surfaces allows complete compatibility with the most modern CAD/CAM and modeling systems. Standard implementation of blobs (also known as metaballs), for advanced organic modelling. Boundary representation of solids makes boolean operations easy even on the most complex parametric and implicit geometries. Constructive Solid Geometry provides a flexible set of modeling instruments to merge multiple objects. More than 40 procedural patterns will allow the user to reproduce whatever surface appearence. The images in this document show a variety of simple combinations of these powerful shading blocks, such as the calm and moved ocean waves, some soft 3d clouds and many types of marble and wood. None of them used a digitized texture. 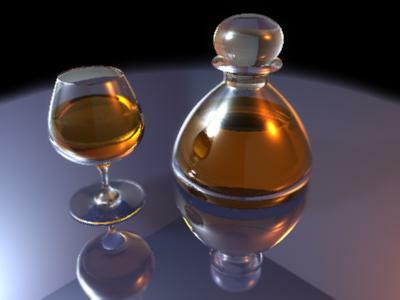 Improved algorithms to obtain fast reflections and refractions with quasi-physical realism. Astonishing realism is reached without great modeling efforts by an accurate use of the automatic depth of field and light glowing capabilities.